Grill Knuckles: Father's Day Steak and Etc. Perhaps somewhat predictably, when my family asked what I wanted to do for Father's Day, I told them I wanted to cook myself a steak. So I bought 2.5 lbs of ribeye on Saturday. The woman working the meat counter was very helpful. She assisted me in getting two nice, thick cuts which were even straight across. The first couple we looked at were wedge-shaped. In other words they started thick at one end and got skinny as you cut across. Obviously a uniform thickness is preferred. So going back to the asado for a moment. My cousin is in Uruguay and among the things she and her friends have cooked up are peppers with an egg and some cheese inside. Wasn't sure how to pull this off, but also figured it might be hard to screw it up, so I just went for it. I also have a good friend in the wine business.He generously gave me a wonderful bottle of wine for Father's Day. He told me to refrigerate it for 20 minutes and then uncork it 20-30 minutes prior to serving. Done. As I cooked the steaks (seasoned with salt & pepper after I sprayed them with olive oil), I took some short videos with my iPhone. My good friend, James Hogan, was very generous with his talent and time. He strung the videos together into one stream; added some images and some music; and came back with the above video on how to cook a steak T Rex style. Check it out! You may know James for his excellent blog at www.jamesdhogan.com. You may also have seen the very-flattering write up he did on me and this blog back in April. Thanks a ton, James. The video turned out much better than I expected. Meanwhile the steaks came out perfectly. I pulled them when their internal temps were in the high 120s on my Thermapen. 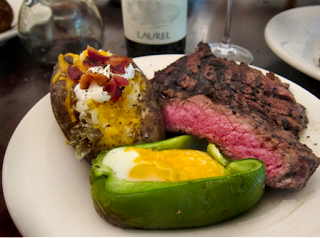 I guess it's pretty archetypal daddy grub, but I love me some steak with baked potato. The more stuff on the potato, the happier I am. And by golly! The egg pepper thing was really good! I think it could use a little seasoning in there, but it was mighty good on its own. I just cooked it until the egg looked done. And by the way, the pepper makes for an impressive heat shield. The eggs took longer to cook than I realized. Suffice it to say, I was pretty satisfied at the end of this meal. It's good to be a dad.